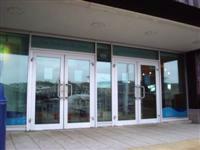 The National Marine Aquarium is the largest public aquarium in the UK welcoming 300,000 visitors per year (including the 30,000 school students who engage with our innovative Just Add H2O Schools Programme). 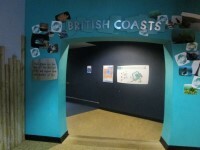 Our awe-inspiring exhibits, featuring marine animals from near and far, provide an environment that intrigues, inspires and motivates our visitors to engage with our conservation messages and hopefully do their bit to help protect the marine environment. Please use the post code PL4 0DX for Sat Nav purposes for the rear Blue Badge parking. Last entrance is 1 hour before closing. 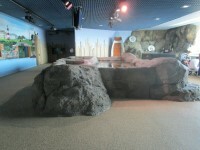 Peak Season opening 09:30 - 18:00. Last entrance is 1 hour before closing.. 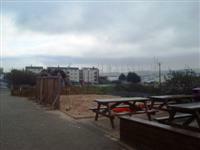 This venue is situated in Coxside, Plymouth. 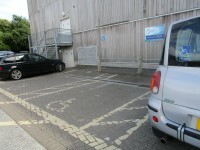 The car park is located at the back of the venue for Blue Badge only. Standard parking is in a nearby multi-storey. 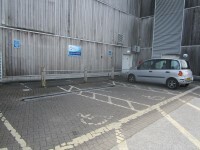 The dimensions of the Blue Badge parking bay(s) are 360cm x 470cm (11ft 10in x 15ft 5in). 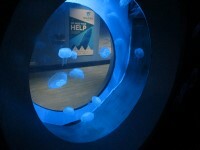 The nearest Blue Badge bay is 200m (218yd 2ft) from the main entrance. 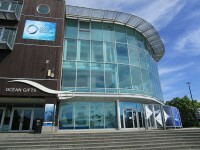 The furthest Blue Badge bay is 210m (229yd 1ft) from the main entrance. 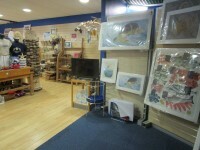 The car park is for the use of Blue Badge holders only. 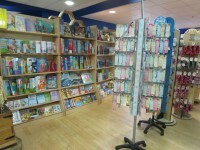 There are standard size bays for Blue Badge holders only in the same location. 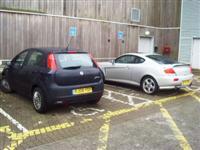 Parking spaces are available on a first come first served basis. 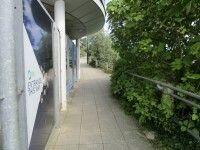 The ramped path from the car park is very long but does have regular level resting areas. 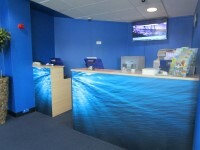 (Photograph 4). 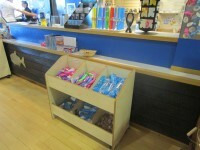 You are on Level Change (Main and Ocean Gift Shop Entrances). Skip to the next section. 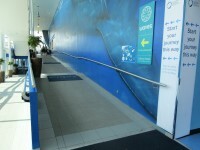 The ramp/slope is located to the right as you face the entrances. 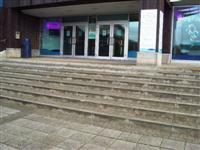 The step(s) is/are located in front of the entrances. 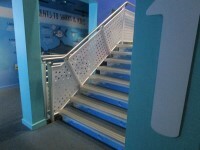 The ramp is used to bypass the steps. 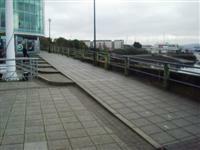 The entrances can also be accessed from the car park at the rear of the building via ramp. 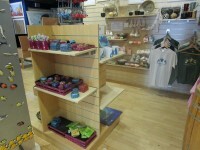 You are on Outside Access (Oceans Gift Shop Entrance). Skip to the next section. 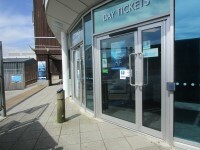 This is also the fast track entrance for members and pre paid ticket holders. 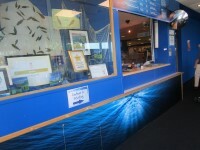 The desk/counter is 2m (2yd 7in) from the main entrance. 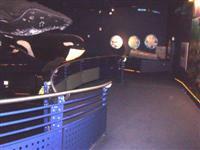 Free entry for carers. 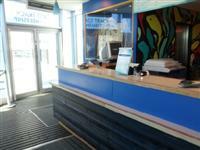 To arrange call the Duty Manager on 0844 893 7938. 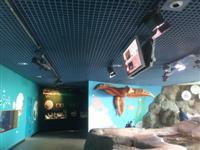 Most of the displays are at a height a wheelchair user can see easily. 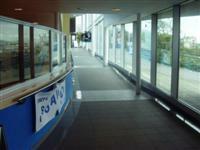 The ramp/slope is located throughout the building. 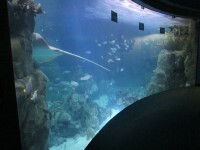 A large section of the aquarium has ramped access. 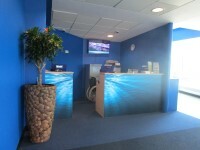 There are regular level resting areas. It is possible to start visits at the top of the building and travel down the ramps if preferred. 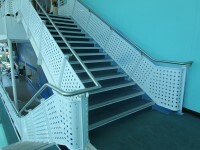 The floors which are accessible by stairs are 1, 2, 3 and 4. 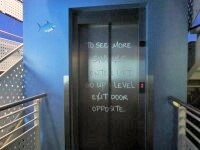 You are on Lift (Blue Lift). Skip to the next section. 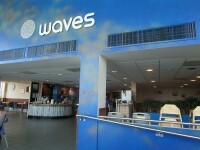 The lift is located in waves cafe. The lift is approximately 7m (7yd 1ft) from the the ramp. You are on Lift (Function room). Skip to the next section. 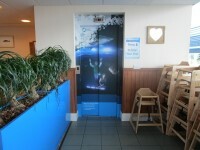 The lift is located next to Horizons Coffee Bar. 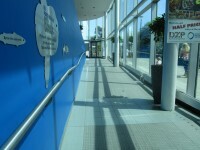 The floors which are accessible by this lift are 3 and 4. The lift is approximately 30m (32yd 2ft) from the A lift. 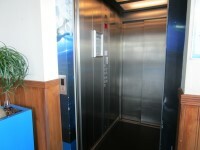 The dimensions of the lift are 120cm x 235cm (3ft 11in x 7ft 9in). 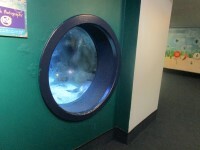 The lift is located in the main corridor. 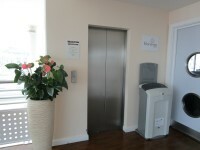 The floors which are accessible by this lift are 1 and 2. 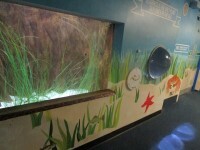 The lift is approximately 150m (164yd 2in) from the main entrance. 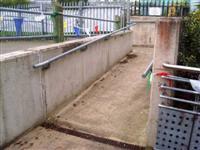 The dimensions of the lift are 105cm x 210cm (3ft 5in x 6ft 11in). 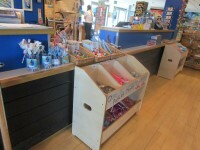 To borrow the wheelchair, please ask at either reception desk. You are on Theatre (Exhibit Galleries). Skip to the next section. 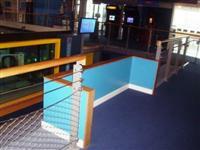 The exhibits which have viewing galleries have a designated seating area for wheelchair users at the back. You are on Cinema (4D). Skip to the next section. All screens have not got level access. This venue does not have audio description. 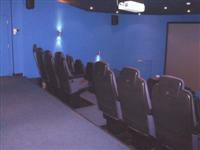 The level area at the back of the cinema is accessible to wheelchair users. The alternative is to transfer to a seat. The nearest table is 3m (3yd 10in) from the the lift. 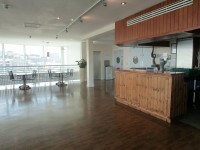 You are on Restaurant Bar Internal (Horizons coffee bar (for functions)). Skip to the next section. 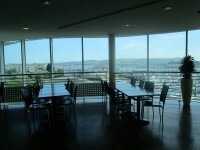 The nearest table is 2m (2yd 7in) from the Lift A. 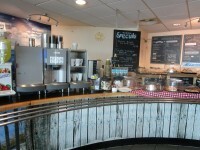 The type of food served here is Coffee and drinks. 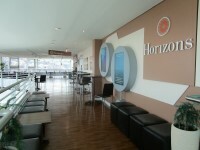 The Coffee Bar is only for groups using the function suite (Horizons) Most tables 71. 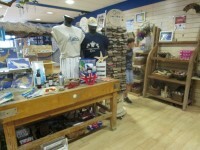 You are on Ocean Gift Shop. Skip to the next section. 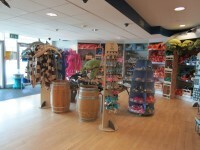 The shop is immediately before the exit. 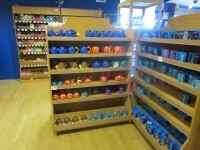 There are lower displays and counters and aisles are more than 100cm wide throughout. Lighting is bright. 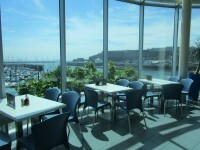 You are on Level Change (Maritime Garden). Skip to the next section. 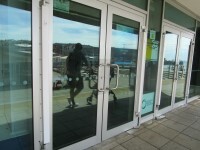 You are on Accessible Toilet (Deck 2 - Café). Skip to the next section. This accessible toilet is approximately 5m (5yd 1ft) from the A lift. This accessible toilet is located on deck 2, in Waves Cafe. 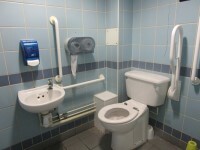 The dimensions of the accessible toilet are 200cm x 145cm (6ft 7in x 4ft 9in). 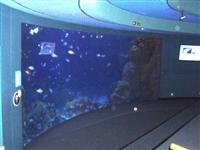 You are on Accessible Toilet (Deck 2 - Eddystone Reef). Skip to the next section. 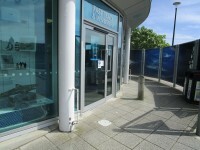 This accessible toilet is approximately 100m (109yd 1ft) from the main entrance. 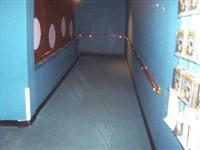 This accessible toilet is located on deck 2. 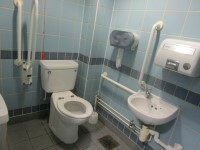 The dimensions of the accessible toilet are 210cm x 140cm (6ft 11in x 4ft 7in). 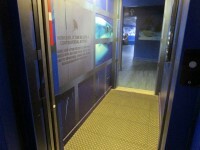 The female and male toilet facilities that were surveyed are located on deck 2, in the Atlantic Reef exhibit. 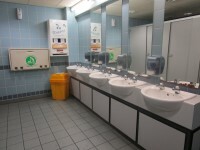 The female and male toilets are approximately 100m (109yd 1ft) from the main entrance. 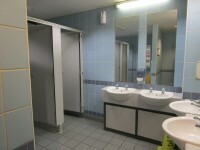 Baby change facilities are located in both standard toilets. 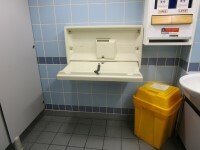 The height of the baby change table once extended is 105cm (3ft 5in). 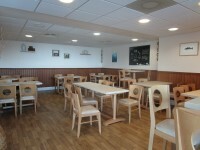 Additional standard toilets are available on deck 2, in the Ocean View Café.